Janice, first, congratulations again on the story in KWIK KRIMES. When you mentioned Charles Dickens and the, in my opinion, sometimes excessive length for the story being told, I remembered a favorite teacher telling me to excuse Dickens' wordiness because he was frequently being paid by the word. 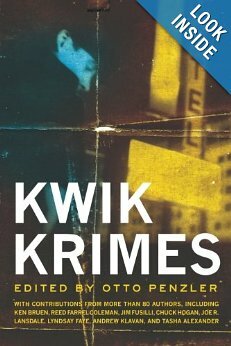 Imagine my surprise when you wrapped the KWIK KRIMES story to the same concept though in this case, pay depended on fewer words instead of more.I'm looking forward to reading KWIK KRIMES. I've never read any of your work that I didn't appreciate. If I remember correctly, an awful lot of magazine writing and freelance newspaper work was paid by the word- as AHMM and EQMM are to this day. Good piece. Decades ago every story I wrote ended on page eleven. it was absolutely creepy how that happened. When i worked in a public library we had a handout of short high quality novels for high school students who had to read a novel.I remember The Old Man and the Sea and Steinbeck's The Moon Is Down were on it. Maybe fahrenheit 451? My favorite length writing is the short story - I've written a couple of novels, but haven't been that comfortable with it. Yet. My favorite length reading is whatever keeps my interest: from short-shorts all the way to - yes I've read it - War & Peace. Janice, congrats on your KWIK KRIMES. I was going to send you an e-mail with questions about the anthology, but you already covered everything in your article. It's a nice feeling being invited to submit, isn't it. And to be invited into one of Otto's books is a mark of distinction. Good for you. Will be expecting to read more of your short stories in the future. Enjoyed your thoughts here, Janice. It seems that I write longish short stories and shortish novels. I've always been a little contrary. Congrats again on Kwik Krimes! I'll shop for Kwik Krimes at my KwikMart store. I do like short, snappy fiction and wish I could find more. Janice, I'm one of those who think story lengths seek their own level and yes, perhaps writers as well. Rob's comment about novels reminds me that short novels for high school students who are unenthusiastic readers used to be in much shorter supply- in my day it was The Red Badge of Courage-which at least one of my friends did not find to be a page turner.